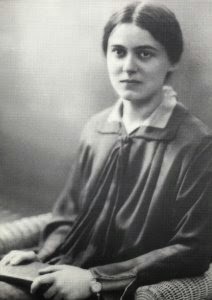 "We bow down before the testimony of the life and death of Edith Stein, an outstanding daughter of Israel and at the same time a daughter of the Carmelite Order, Sister Teresa Benedicta of the Cross, a personality who united within her a rich life a dramatic synthesis of our century. It was a synthesis of a history full of deep wounds that are still hurting…and also the synthesis of the full truth about man. All this came together in a single heart that remained restless and unfulfilled until it finally found rest in God"
Today is the feast of one of our patrons, Edith Stein or Sister Teresa Benedicta of the Cross. I couldn't let her feast go by without honouring her, so pour yourself some coffee or tea and read about a truly extraordinary woman. 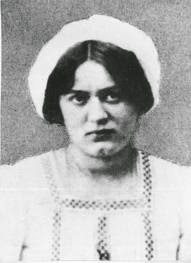 Edith was born into a Jewish Family on Yom Kippur, October 12th, 1891, the youngest of 11 children. Her father died when she was 2, leaving her mother to run the large timber business he left and raise the children. Somewhere along the line, Edith says she lost her faith - she "consciously decided, of her own volition, to stop praying", and she went on and studied German and history at university. Although German and history were her fields of study, her real love was for philosophy and women's issues. Edith was very intelligent and after a short stint as a "radical suffragette", she transferred from the University of Breslau to Gottingen University and studied under two different philosophers, Edmund Husserl and Max Scheler, who both directed her, in different ways, to Roman Catholicism. When World War I broke out, she worked nursing typhus patients in an Austrian field hospital where she struggled with the horrors of war and rampant disease. After the war she took up her studies once again, passing her German and history degrees with distinction, yet continuing her education in philosophy - writing her doctorate thesis on the problem of empathy. It was during this time that she wrote about an experience which had a lasting effect on her - she witnessed a woman entering Frankfurt Cathedral for a short prayer. "This was something totally new to me. In the synagogues or protestant churches I had visited people simply went to the services. Here, however, I saw someone coming straight from the busy marketplace into this empty church, as if she was going to have an intimate conversation. It was something I never forgot." Not long after that, a dear friend was killed in action and Edith met with his widow, a woman of faith. Edith wrote that the visit was the moment when her "unbelief collapsed and Christ began to shine his light on me - Christ in the mystery of the Cross." It was shortly after this experience that Edith, while visiting the country estate of a protestant friend, picked up the autobiography of St. Teresa of Avila. She read the whole thing in one sitting saying "when I had finished the book, I said to myself, this is the truth." 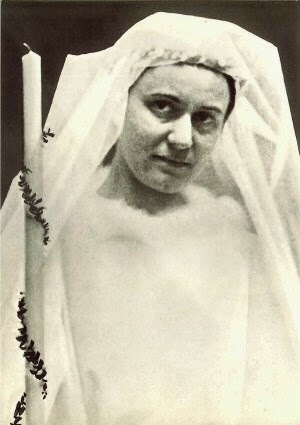 On January 1st, 1922 Edith was baptized into the Catholic Church. "I had given up practising my Jewish religion when I was a 14 year old girl and did not begin to feel Jewish again until I had returned to God." Immediately following her conversion she wanted to join the Carmelites, but was urged not to do so by her spiritual director and other advisors. She began accepting speaking engagements on women's issues and wrote, "During the time immediately before and quite some time after my conversion I…thought that leading a religious life meant giving up all earthly things and having one's mind fixed on divine things only. Gradually, however, I learned that other things are expected of us in this world…I even believe that the deeper someone is drawn to God, the more he has to 'get beyond himself' in this sense, that is, go into the world and carry divine life into it." When she finally realized that it was possible to "pursue scholarship as a service to God", she began to seriously approach academic work again, frequently staying at the Benedictine Monastery in Beuron to gain strength for her work. In the next several years, she looked for (but could not get) a professorship, but wrote several books in the ensuing years. Eventually she accepted a lectureship at the University of Munster and in and through her teachings, strove to lead all to the Lord. When World War II broke out, the Nazi's prevented Edith from teaching or lecturing due to her Jewish background, and she joined the Carmelite Convent in Cologne after visiting one last time with her mother. When it became apparent to the Mother Superior in Cologne that Sister Teresa Benedicta would be sought out and harmed by the Nazi's, she was smuggled across the border into the Netherlands to the Convent in Echt, but to no avail. Sister Teresa was arrested by the Gestapo on August 2nd, 1942 and, together with her sister Rosa (who had also converted and was serving the convent at Echt) and many other Jews and Catholics, was transported to Auchwitz and gassed a few days later - probably August 9th. 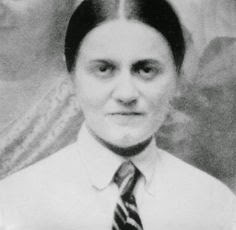 Until the very end, Sister Teresa Benedicta suffered and prayed for her brothers and sisters, both Jewish and Catholic, and Prof. Jan Nota, a dear friend, said of her: "She [was] a witness to God's presence in a world where God [was] absent." 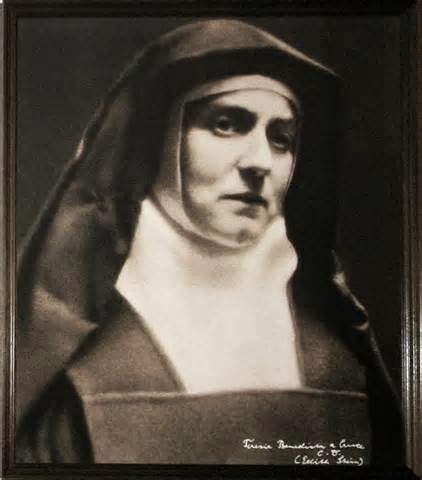 St. Teresa Benedicta was canonized by Pope John Paul II in 1998 and is co-patron of Europe, along with Benedict of Nursia, Sts Cyril and Methodius, St. Bridget of Sweden and St. Catherine of Sienna. She is one of my faves. Such a beautiful woman, and her writings on womanhood have been really influential in my life. I was smiling all day yesterday. Excellent. Such a beautiful saint!